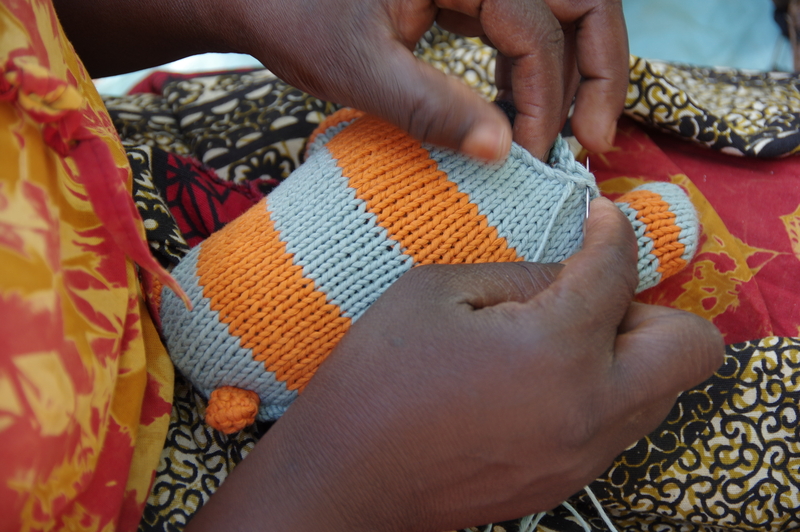 These are the beautiful hands behind each lovely eco friendly toy developed by Yawama of Sweden. 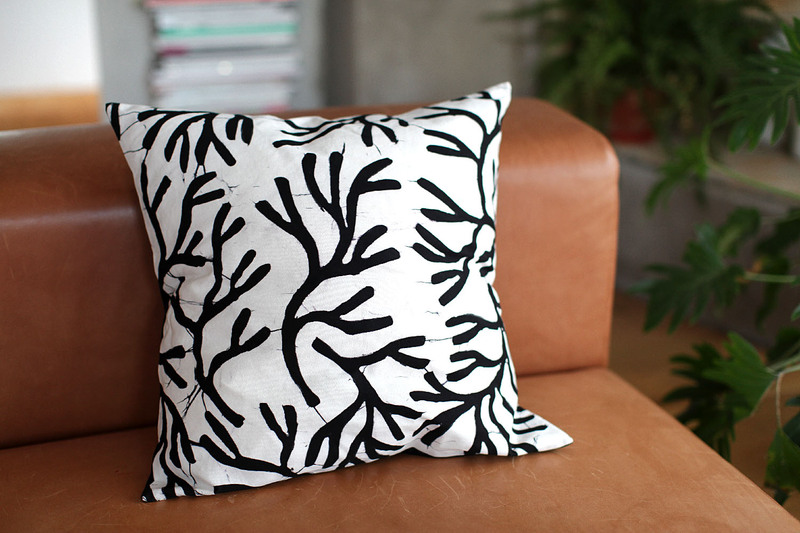 Just before Christmas in anticipation of 2015 Yawama of Sweden launches a small batik range of monochrome black and white cushion covers for the modernist or the earthy interior decorater. 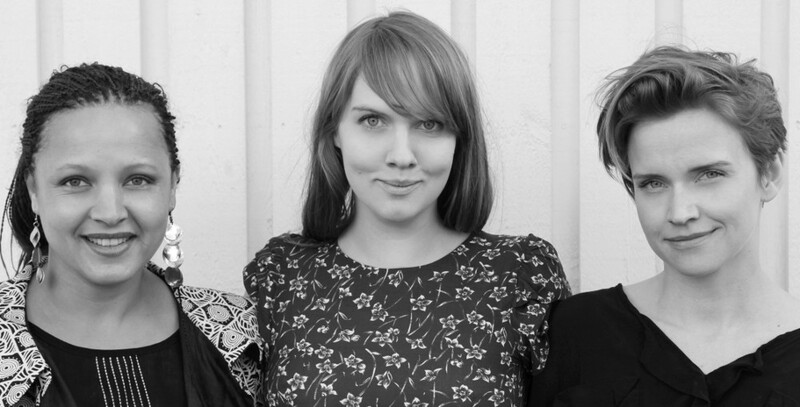 Would you like to add an ethical twist to your Scandinavian look? 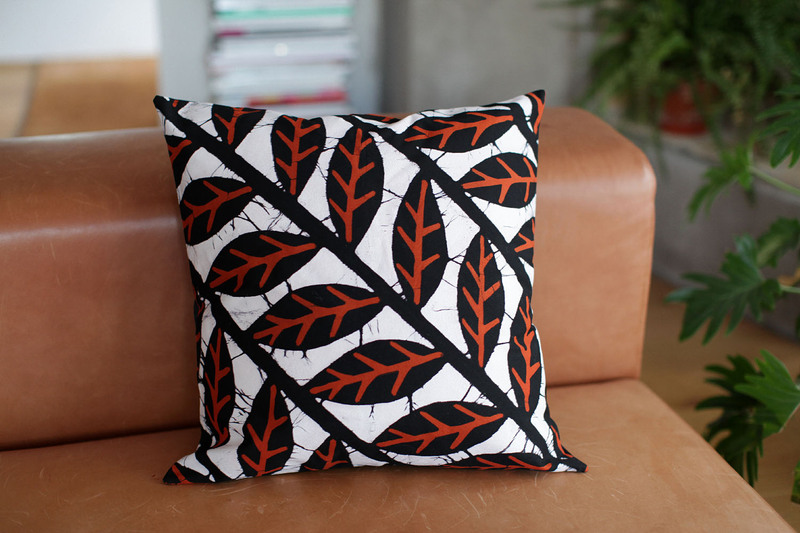 These batik cushion covers should do the trick. 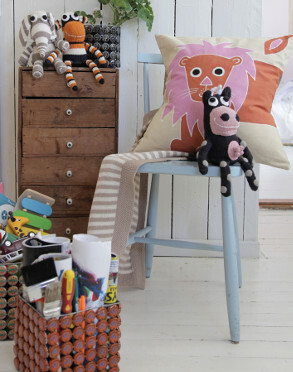 These cushions are not just African inspired but they are handmade in collaboration with Yawama of Sweden by women in Swaziland at Baobab. 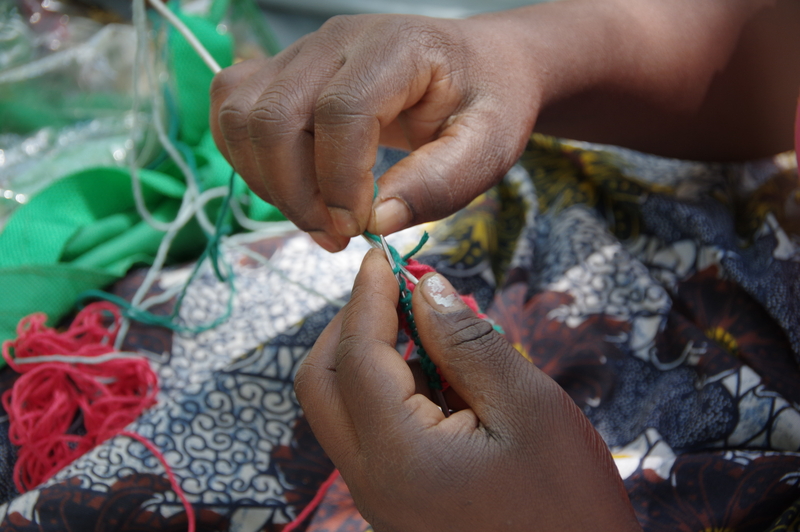 Baobab is a small enterprise employing 25 women in Swaziland. All the women and predominantly single mothers. 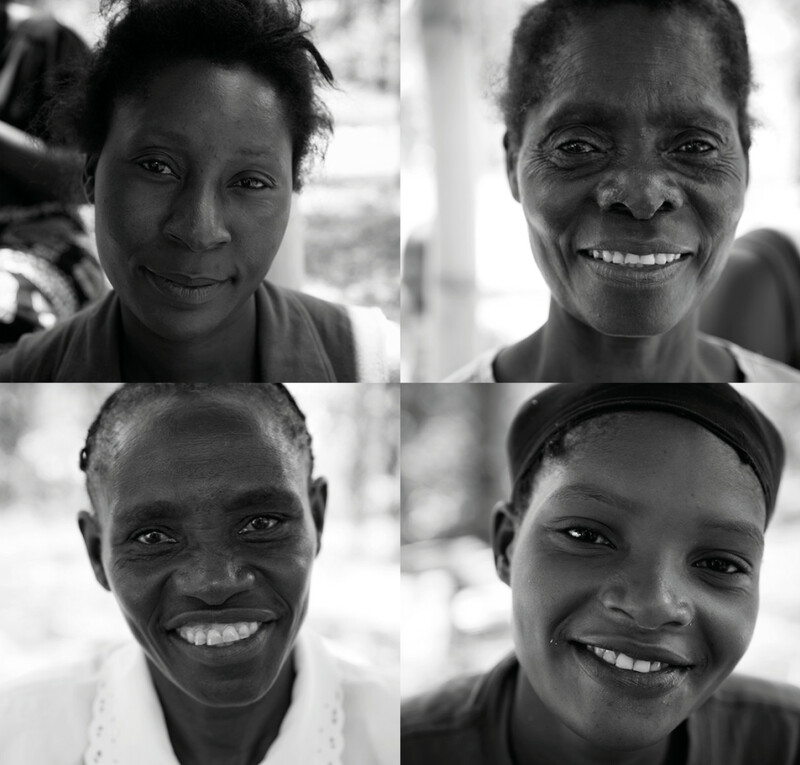 Baobab provides the women with tools to adapt to the growing responsibility and the shift in women’s roles in communities. Baobab is a member of SWIFT (Swaziland Fair Trade), an organization that supports the development of the handicraft industry in the country. These cushion covers have been created by skilled artisans through a tedious process. Hot melted wax is artistically applied in specific design to a white fabric. The fabric is then submerged into a dye bath, the wax acting as a resistant on the fabric allowing the uncovered fabric to be dyed. The fabric is then left to dry in the sun. This process is repeated layer upon layer. The wax is then removed by boiling the fabric and a unique fabric with a crackled effect is created. 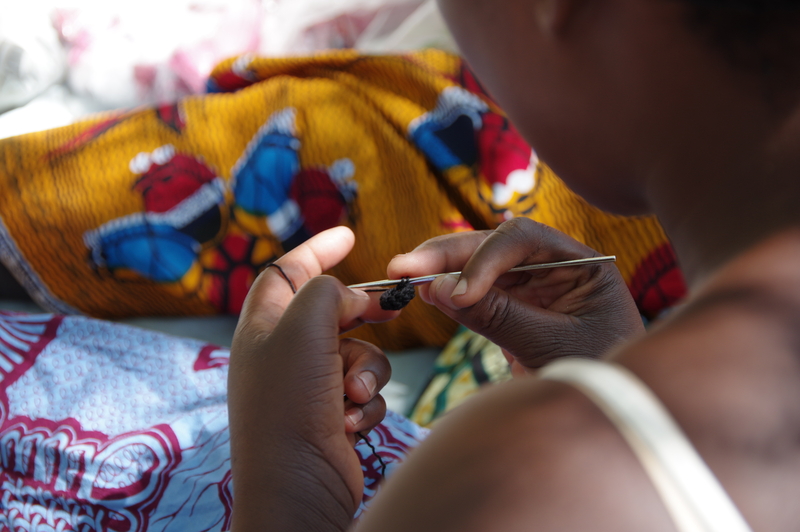 The dyed fabric is then cut and sewn into uniques pieces such as our batik covers. 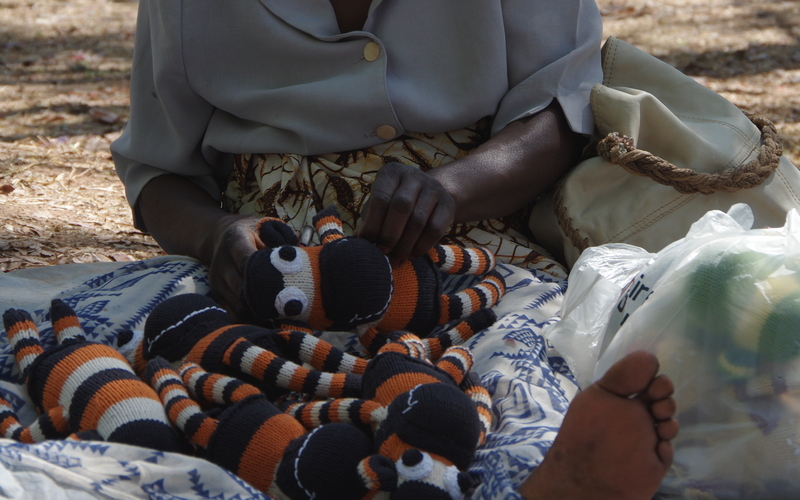 This is Emily one of the ladies behind our beloved ecological soft toy Kolwe. 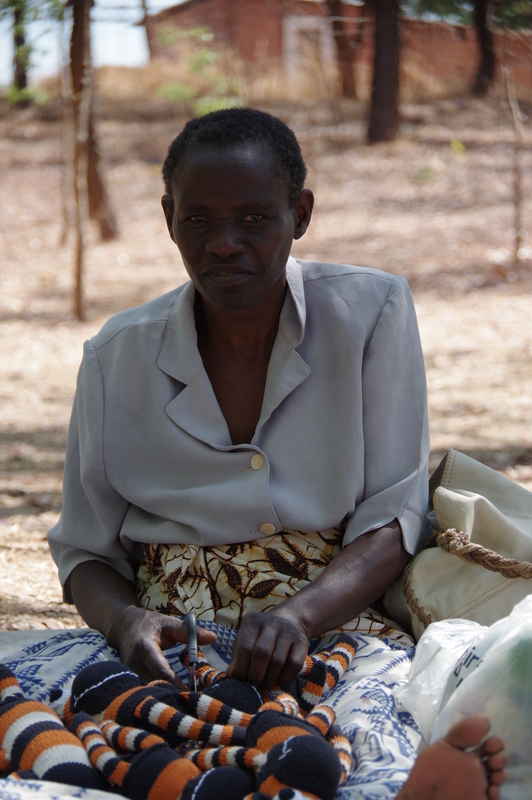 Emily is 67 years old, a widow and has 4 children. Her firstborn Lloyd is a farmer. Her second-born Ruth is married with 4 of her own children. Her third-born Feston is at teaching college and last-born Mapens is in grade 12 and living with his Aunty. Emily is a Minister at her local church, where she delivers sermons 3 times a week and keeps the church clean and tidy – all voluntarily! Emily lives in a two roomed house at the church with 4 young children, 3 of whom belong to her sister’s daughter and 1 being her firstborn’s son. She likes to get up at 4:00 am to write her sermons as it is quiet and calm at that time and she can pray in peace. Otherwise she is often disturbed by her neighbours seeking advice – she us clearly a well-respected member of the community! YES YES YES. WE PASSED! When this E mail came a few weeks ago I almost felt like I was back at school receiving exam results. After spending months trying to source an African organic cotton supplier, the little Ndaba team in Zambia together with the team at Yawama of Sweden ( Anna Lidström and Clara Lidström and myself) worked on new designs for the Yawama Kids. You can only imagine my excitement when ALL our toys PASSED in ALL areas of the safety test. I could not have done this alone. 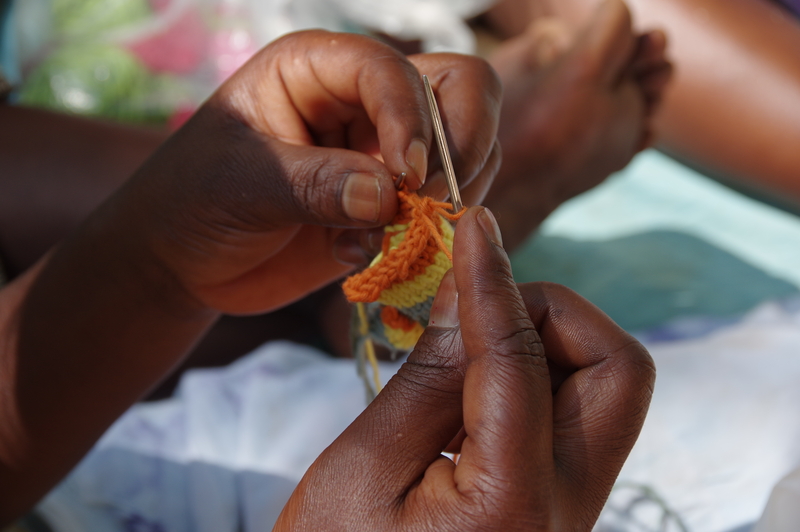 Thank you Charles at Little Ndaba and to Erin from Totoknits for your commitment to design, development and women empowerment in Africa. Developing toys to meet European safety standards can be costly business but can also be done in your home kitchen. We have tested both options. I have had so much support from Conformance and have run many trial run tests on our prototypes at home before sending our toys to the lab for analysis for official testing. So when I sent our 12 soft toys off I knew exactly what their fate was. Torture. 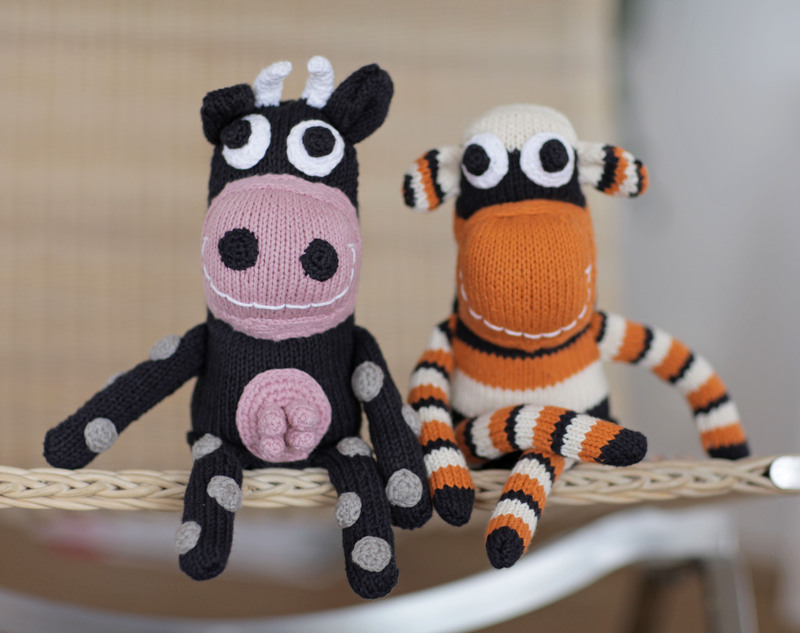 European standard EN 71 specifies safety requirements for toys with specific regulations for soft toys. Compliance with the standard is legally required for all toys sold in the European Union. 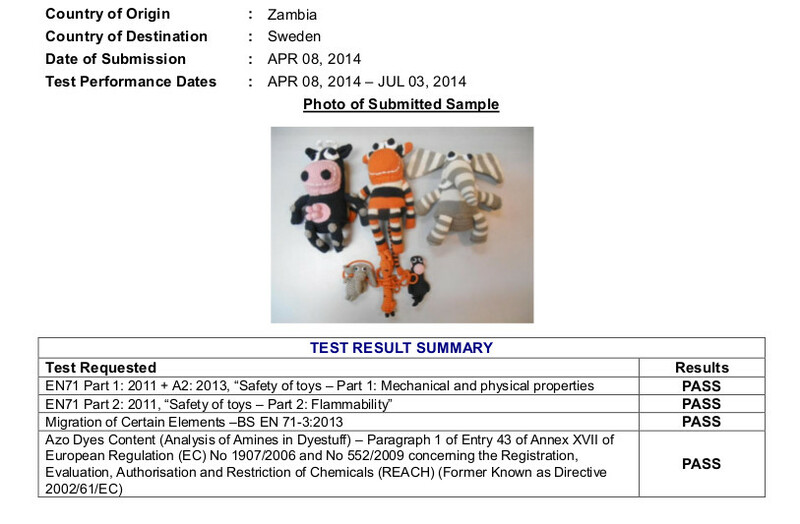 The standard has been published in 12 parts and includes tests for flammability to ensure that fire does not spread quickly if the toy were to catch fire, mechanical testing to ensure that body parts and smaller parts can handle a certain weight before falling off and that dangerous elements are not present in the toy.